I always look at pictures in magazines and go green eyed at how shiny these models and celebrities get their hair, but then I remember, they probably had someone primp and preen them within an inch of their life. When I was a brunette (my natural colour), I always got complimented on how glossy my hair was, and I always felt quite smug as never did anything to it, didn't even use conditioner really. So now for the umpteenth time in my life I have blonde hair (I get bored very easily) and I think it is probably the lightest it has ever been. With that comes the fact that light doesn't particularly bounce off blonde hair the way it does with dark hair. My hair is also much drier, and unless I do something to it after I have thrown it upside down and blasted it with the hairdrier, I feel I look a bit of a hag! 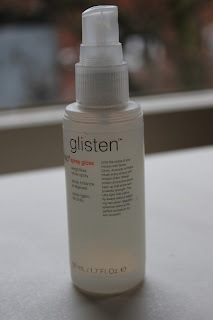 I'd rather not use my ghd's if I'm not going anywhere, so I reached for my old trusty mop glisten spray gloss last week, and have used it every day since. It is a really light formula, including avocado oil, wheat protein and amino acids to help infuse the shine. 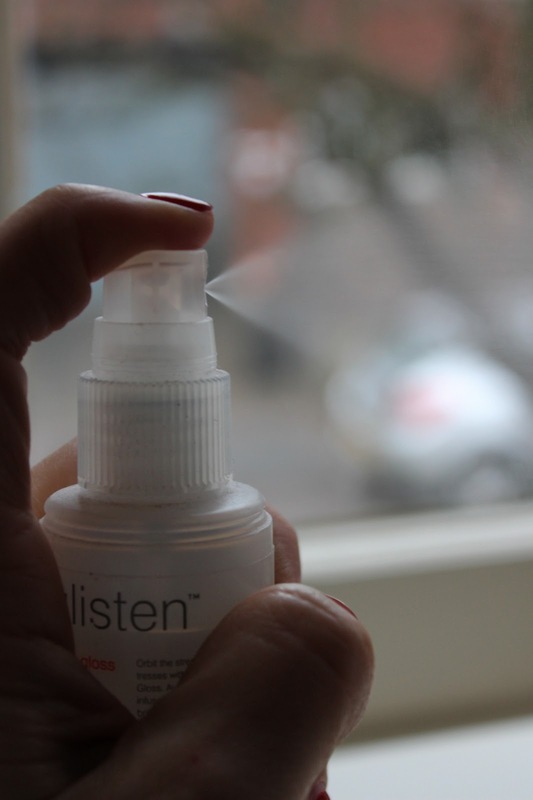 The spray action is perfect, I have had this for about 18 months, and sometimes pump action sprays can get clogged and not evenly disperse, but I still get a perfect satisfying cloud of mist settling on my hair. The best thing about this is it is perfect handbag size, it's 50ml, but i still have well over 3/4 of the bottle left as the spray is such a good sized aperture that you get a really good coverage, I probably use 4 sprays for my whole head of hair, and it also (for me) acts perfectly as a serum, to tame the fly away hairs. Normal serums are too heavy for me, but this does the job perfectly. Do you have any tips for making your blonde hair shine? I'd love to hear them!